How Much Can You Make in a Child and Adolescent Psychology Career? What Courses Can be Taken for an Online Child and Adolescent Psychology Degree? Child psychologists work with people from infancy to the brink of adulthood. These professionals spearhead efforts to understand and address challenges faced by their target population. Earning a bachelor’s in child psychology provides students with foundational knowledge and pertinent skills, which can be used in the field immediately or applied toward advanced degrees that lead to licensure. Coursework includes child and adolescent development, experiential learning, assessment, and behavioral analysis. Additionally, students who wish to pursue their degree online have access to an array of flexible programs equal in content to on-campus programs. According to the Bureau of Labor Statistics (BLS), the job outlook for all professionals in this field is projected to grow 14% by 2026. This guide covers vetted programs, earning potential, strategies for choosing the most suitable program, potential occupations, funding options, and ways to offset school costs through scholarships. Online universities vary in quality and accreditation, which means that identifying suitable programs requires research. Below is a list of online bachelor’s in child and adolescent psychology programs that outlines what students need to qualify and succeed. All programs have been vetted through the Integrated Postsecondary Education Data System by examining information such as the cost of tuition, graduation rate, program specific resources, and overall student services. 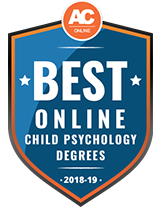 Earning a child psychology degree online positions graduates to qualify for career opportunities geared toward helping children. The job outlook for positions related to child and adolescent psychology should increase faster than average growth rates. According to the BLS, psychological services in schools, social service agencies, hospitals, and mental health centers are growing because of raised awareness about factors that influence children psychologically. While no degree secures a career or salary, this degree does ensure students possess pertinent skills required for the careers listed in the table below. Psychologists focus on the influence emotional, social, and cognitive processes have on behavior. These professionals observe, interview, and conduct studies on their patients. Other duties include diagnosing disorders, writing scholarly articles, and managing others. Most professionals work in schools or state-funded facilities. These positions often require additional licenses, certifications, or advanced degrees. Requirements vary by state. Child and family social workers strive to protect vulnerable children. These professionals assist clients in solving and coping with everyday life dilemmas. Other duties may include intervention when neglect or abuse is present. At times, professionals may place children with a foster or adoption family. There are entry-level positions available with a bachelor’s in child psychology. As a social and community service manager, professionals identify and oversee administrative duties for programs needed in their community. Other duties include managing outreach activities and writing proposals for funding. These professionals often work for individual and family services. While a bachelor’s degree is mandatory, employers also like to see work experience. Substance abuse, behavioral disorder, and mental health counselors evaluate their clients’ problems or addictions to develop a treatment plan. Professionals may need to educate immediate family members about assisting with the patient care. While these professionals can work with people of all ages, graduates with a child psychology bachelor’s degree qualify to work in facilities that provide specialized care to children and adolescents. Probation officers and correctional treatment specialists help law offenders through their rehabilitation process. Duties often include evaluating clients to determine a care plan, testing clients for drug usage, and writing reports. This role requires candidates to have a bachelor’s degree to qualify. Professionals with a child psychology degree are great candidates for juvenile detention centers. While overall salary projections are valuable for formulating general expectations, there are multiple factors that can influence wages. For instance, projected income varies by geographic location, demand, credentials, and experience. According to the BLS, New Jersey, Alaska, and Hawaii are the three top paying states for this field in general. In addition, schools, health practitioner offices, and family services facilities have the highest levels of employment. This list below examines salaries and job growth data for all states in this field. Students are introduced to psychology from a broad perspective by learning key figures and theoretical perspectives that have contributed to contemporary psychology. Students also develop research methods. Students explore theories, methods, and concepts used in child psychology. Students learn how to differentiate the specialized needs and processes for dealing with young patients. Course content includes intervention and communication styles. This course helps students understand the developmental needs of children and adolescents. Coursework covers theories of development, learning, personality development, functioning, and behavior. Students learn to identify both normal and abnormal development. This course helps students to view psychological processes as a science. Students engage in methods that prove or disprove hypotheses, which provide evidence to support theories. Students should have some statistical background knowledge for this course. Through the study of formal assessment implications and theories, students examine procedures for reporting assessment results. This course also discusses legal implications and ethical practices. There are multiple factors to consider when choosing a child psychology degree. A great place to start is by identifying if the program is regionally accredited and if there are programmatic accreditations. While students should certainly consider tuition, there are also other costs that may be incurred through program requirements, such as internship or clinical fees. This section addresses common questions about online bachelor’s degrees in child and adolescent psychology. What accrediting agencies should I look for when researching online child psychology programs? At the bachelor’s level, child psychology degrees are not accredited programmatically. However, students may want to consider advanced degree programs accredited by the American Psychological Association because their curriculum is structured to satisfy accreditation requirements. Students may also want to consider regional accreditation for the school as a whole. 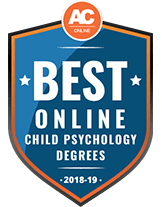 How much is tuition for an online child psychology bachelor’s degree? Tuition costs vary. Students should consider what they value in a program to help narrow down the type of university that fits their needs. For instance, if students want their degrees from a brick-and-mortar school that offers online programs, they may pay higher tuition than at a fully online university that can afford to make tuition less expensive. How long does it usually take to complete a bachelor’s in adolescent psychology online? There are multiple formats for distance learning programs. Many programs offered by brick-and-mortar schools often follow traditional semesters and credit hours, which allows students to graduate in about four years. Students who wish to or can afford summer courses can graduate in under four years. There are also accelerated programs that use eight-week semesters and continue classes during the summer, which allow students to graduate in three years or less. Do online child psychology programs require practicums or internships? Similar to traditional schools, online programs must satisfy state licensing requirements to stay in compliance with accreditation standards. Therefore, most programs that require hands-on experience do require an internship or practicum. Students are allowed to complete these hours at an approved, local facility. However, not all career paths require licensure. Students should identify their ideal role to see if internship hours are necessary. Are there professional organization that child psychology students can join while in school? There are many professional organizations that offer membership to students in school. Additionally, student membership creates opportunities for networking, tuition assistance, and mentorship. The American Psychological Association is the leading professional psychological organization in the U.S. Student members receive access to academic journals and career services upon graduation. There are also psychology organizations for specific job roles and specializations. Affordability is a major concern for students considering an online bachelor’s in child psychology. Many students immediately consider FAFSA grants and loans. While grants are ideal because those funds do not have to be repaid, loans must be repaid and they collect interest. Therefore, in addition to grants, students should consider applying for scholarships. There are many foundations and professional psychology organizations that set aside funds to help students pay for their tuition. Students who come from underrepresented or low-income homes can apply for the Ann-Marie Ogletree Child Development Scholarship. This scholarship is for students who wish to study child and adolescent related fields, which is a great option for child psychology students. This is a one time award. Students must be enrolled full time and have a 2.75 GPA to qualify. Awards range from $500 to $1,000. The American School Health Association offers a $250 scholarship to one undergraduate student who plans to use their degree in school-related mental health positions, such as school nurse, school counselor, or school social worker. Child and adolescent psychology majors in their junior or senior year are welcome to apply. This scholarship requires students to submit a 2-3 page personal statement describing their professional goals. Students must also have at least a 3.0 GPA to qualify. The APA Society Convention Research Awards are provided by PSI CHI, the international honor society in psychology. PSI CHI strives to encourage exemplary research and application of research findings. Students must submit a research poster and proposal to be considered. Selected candidates must be physically present at the PSI CHI annual convention to receive their award. The top two undergraduate presenters receive $400 scholarships. To be considered, students must apply prior to April 15. The American Psychology-Law Society (AP-LS) recognizes undergraduate students who submit exemplary research papers that emphasize the relationship between psychology and law. Students are responsible for creating and conducting research on their own unique topic. Winners are expected to present at the AP-LS Conference. The thesis must be less than 20 pages and students must submit a letter of support from a faculty supervisor. The first place winner will receive $500, second place $300, and third place $150. With a growing need for professionals committed to improving mental health, the American Addiction Center offers undergraduates a $2,500 to $5,000 scholarship to offset school costs, which is perfect for students majoring in child psychology. To apply, students must submit a 500-word essay discussing potential challenges and solutions for getting patients into addiction treatment. Students must hold a minimum 3.2 GPA to qualify.